The very predicted inaugural King of Carnac competition took place on Saturday 15th August. The motley staff of 30 windsurfers, 30 kite surfers and about 20 catamarans assembled during the Jervoise bay sailing club. After a thorough briefing the windsurfing contingent were expecting a lengthy delay the westerly wind to shift to a better SW path for the 8km cost Carnac. It was not to ever be, the preparatory flag went down suggesting a minimum of 30 mins to the begin. The kitties hit the liquid and straight away looked pretty operated up whilst most windsurfers looked like struggling unless you had some quite huge equipment. It became obvious that a start was imminent and there was a frenzy of latecomers running from the beach out to the commencement range. The commencement had been a rabbit boat beginning during the windward end associated with range motoring at 20 knots towards leeward mark checking the gate behind it. Windsurfers and kitties received the windward end of the line as the kites started initially to leeward to prevent a kite getting tangled within the kitties rigging (which needless to say we were privately anticipating witnessing!). The commencement got down cleanly. Two things became straight away obvious. Firstly it was likely to be a difficult slog up wind, formula boards had been pointing high and foiling kite boards can aim 20 degrees higher than any other craft on the water. Languishing at backside had been the underdone windsurfer on 7.8 sails and 110 litre boards. My Isonic 127 and 8.6 response 4 seemed to be just large enough become sailing really up-wind but as we got nearer to Carnac island the grass became increasingly more of a concern. I became having a great tussle with Rowen Law and Steve Stratfold even as we crossed tacks many times proceeding within the program towards Carnac. Finally we got across the top mark and started the significantly more pleasant travel down wind. The windsurfers had a certain rate advantage on the kitties down wind plus it ended up being outstanding sensation flying past them to the finish line. 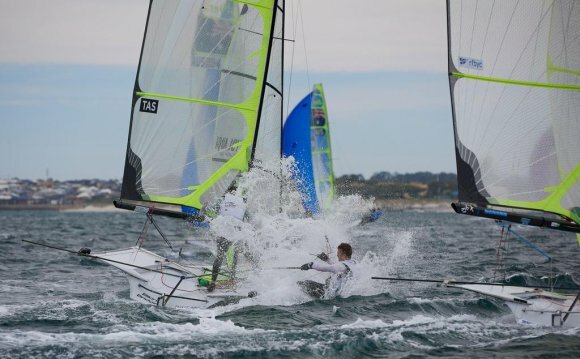 At this stage I was thinking "well I'm glad that is nearly more than" when I ended up being met because of the sight of catamarans in addition to foiling kiteboards finding its way back up the program. We realised with dismay that we had been going round once more. Time and energy to "man up" and sail a little more effectively. I thought I'd done a lot of tacks in the first beat wasting valuable time and power. I experienced the impression the wind should shift more to the south western therefore headed up the remaining region of the course as far as I could. It repaid and I also surfaced towards the top of this course just under Carnac area on the same time as Rowen legislation showed up form the best region of the program. The two of us headed down since broad even as we could and looked like we could ensure it is house in one get to, 8km nearly neck and neck, each of us attempting whatever we're able to getting ahead. Rowen disappeared from my view and I also believed I would got him. The second thing he showed up out from under my sail about 50 m downwind and finished about 10 seconds in-front. We were both streaming grass along the final leg and Rowen had made a decision to stop and flick it off their fin.His strategies worked while the additional speed got him into the range very first. We gone back to the coastline quite fatigued but very happy to have completed. We understood Darryl and Claude had been in front of united states but heard the headlines that bad Claude had missed the finish line and was then repaid from the coastline to undergo the finish so had slipped from 2nd to 4th. Only 12 of the 30 windsurfers completed the program. Mark Slade epitomised dogged determination by-doing 24 tacks up-wind in the first beat and failed to throw in the towel despite constantly getting grass and being well under operated on his 7.8. Very first home and crowned "King of Carnac" had been Torvar Mirsky On their foiling kite board. Initial catamaran finished third general and Darryl Griffith was initially windsurfer on their Formula board and 12m severne reflex sail. The entry charge included a free pizza pie and beer so we relaxed chatting in what might have been if the wind was indeed more powerful and a more conventional seabreeze course. Which will have to wait til the following year. I'm sure it'll take place once more due to the fact organisation and area had been fantastic. A huge Thankyou must go out on organisers, the Jervoice bay sailing club. It had been a brave option to put all 3 art on the exact same training course but it designed for a fantastic begin and a rather tactical race.